Discard any bruised outer leaves of the radicchio, then cut length-wise into quarters, being sure to keep some of the stem attached to each quarter. Trim off any dark bits of stem. Submerge the radicchio quarters in ice water for 1 hour to remove some bitterness. Put a plate on top of the radicchio quarters to keep them submerged. Meanwhile, on a cutting board and using a chef’s knife, mince and mash together the anchovies, garlic, thyme, and red pepper flakes. In a bowl, combine the anchovy mixture, olive oil, and balsamic vinegar and mix well. You should have about 3/4 cup. Prepare a charcoal or gas grill for direct heat grilling over a medium fire, or pre-heat a grill pan in your oven over medium heat. Shake the excess water off the radicchio. Gently open up the leaves and spoon some of the anchovy mixture between them. Spoon the remaining anchovy mixture over the outside of each radicchio quarter. Season the quarters generously with salt and pepper. 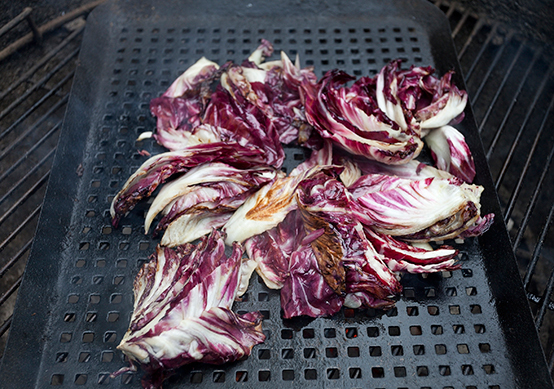 Grill the radicchio, turning occasionally, until browned on the outside but still raw in the center, 3-5 minutes. Serve warm. Serves 4.